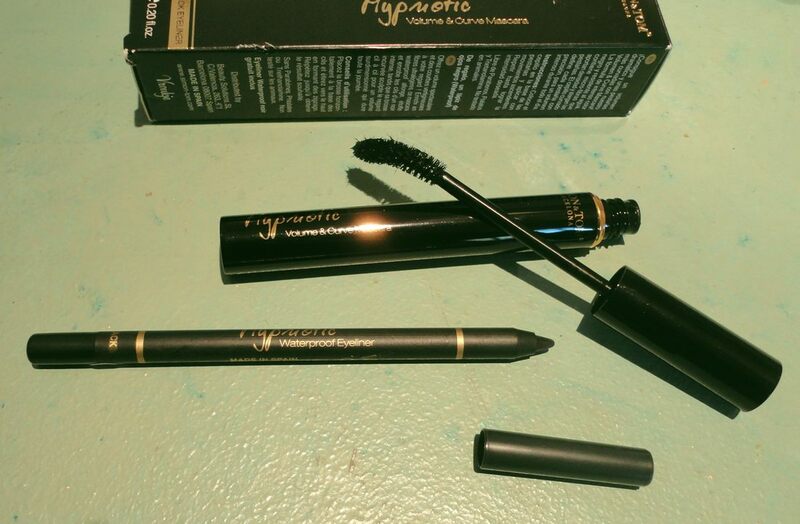 A nice waterproof mascara with a curved applicator and a bonus waterproof eyeliner, perfect for smoky eyes. The colour is a rich black, and the consistency of the mascara is quite liquid, which makes application easy without clumping. The applicator brush is slim and dramatically curved, (basically it matches the shape of my eyes), so it's easy to get the top lashes done quickly, but I find it very tricky for the bottom lashes. I've docked a star because, although there are bits of fibre in the mix, on my very thin lashes, the thickening effect takes at least three passes and is not spectacular. Good for everyday use, and the waterproof eyeliner included in the price makes this a very good deal. The pencil is soft and easy to apply and lasts hours without smudging. The biggest plus is that both products are not tested on animals, and do not contain parabens or phthalates. I must say, this is not the kind of product which I would have been confident enough to buy. However, when I was asked to test and review it, I decided to go for it. Another item I had tried from Simon & Tom had turned out to be top quality, so I had no concerns, I just didn't believe it would do anything. 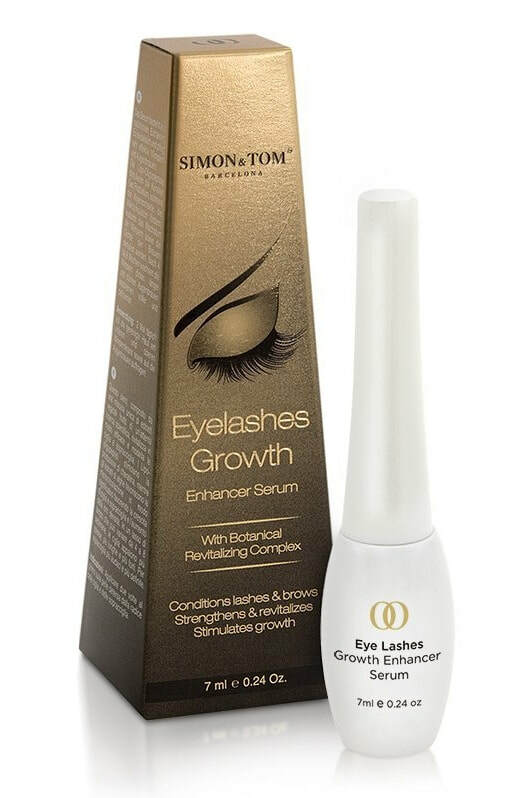 This is an unusual product which is intended to enhance the length and thickness of your eyelashes (and eyebrows). The presentation is sleek and modern, a bulbous little white bottle with a long neck and a pointed applicator, like a very stiff brush. The product itself is a clear liquid, with no scent and leaving no residue. The content of 7 ml (or 0.24 of an ounce) is quite a lot, as it turns out, the same as one of my favourite lip glosses, so I estimate that this quantity can last several months. Anyway, that is what I have been doing, running the point of the applicator over the base of my lashes as though it were eyeliner. Much easier to do on the lower lashes but doable on the upper, with your eye closed and a steady hand. I then wipe what is left on the brush directly over the upper lashes. So, does it work? According to the miniscule print on the box, results can be expected in 4 to 8 weeks. I found that improving my lashes took a bit longer. However, my eyebrows started to show some changes after only 3 weeks. They had been over-plucked and lately had lost colour. To my surprise, they have become not only more filled in, but darker. I wasn't expecting that, and I like it. It's very difficult to fill in eyebrows with a pencil without looking ridiculous, at least I don't have that skill. Having my own, fuller eyebrows back after years of not even having to pluck a stray hair is quite remarkable. My eyelashes have always been long but, with age, they have become very sparse. The effect on them is less pronounced and I attribute this mostly to the limited amount of serum that can be applied at one time without getting it in your eyes. However, after 3 months of almost regular applications (sometimes I forget), I'm starting to see a difference when I put on mascara, in particular at the outer corners of my lower lids that were previously quite bare. There are new, shorter lashes and the old ones are less brittle. It's a small improvement but to me it makes a lot of difference. The list of ingredients translated in English includes mostly natural, plant-derived extracts like Greater Burdock root, Alpine Willowherb, Nettle, Oarweed, Irish Moss, Ginger root and Argan oil. The serum is not tested on animals, which is something I always look for in cosmetics and skin care, so great to see here. So thumbs up from me for efficacy on eyebrows, and now also on my eyelashes. It took a long time but was worth the wait. I would also like to thank Simon & Tom for never once chasing after my review. This lovely cream comes in a wide, plastic pump-operated container. It is light green, very thick and amazingly rich. I don't have cracked heels but still enjoy the very sumptuous feel of this product on my feet, especially now that summer weather and daily pool swims tend to dry the skin. I have also started to use it on my elbows, a heavily-wrinkled area, and on my kneecaps where the skin tends to be drier than elsewhere. This brand has an elbow-specific product but I find this one does double-duty very effectively. I only need a tiny amount because it's so rich and it allows a fairly long massage which, in itself, is very pleasant. In addition to Argan Oil, it also contains Aloe Vera which makes it a safe and gentle anti-bacterial and inflammation soothing preparation. A multi-purpose treatment for the toughest dry skin, I felt the improvement within a couple of applications. I have looked into a lot of lip plumping products because, along with many other undesirable changes the ageing process has brought, thinning lips is one that I can't help noticing every time I catch a glimpse of yours truly in a mirror. I tried a few products, usually in the shape of a tinted lip gloss, but results have been disappointing and usually very temporary. Others seem to burn and actually damage the fragile skin of the lips, so I have given them a wide berth. When I was offered a sample of Lip Booster to review, I accepted with a certain interest and, as usual when I am testing, I discontinued all other similar products to properly assess any effect. The container is very sleek (in Simon & Tom's signature style); a thin tube that slides easily in my makeup bag or handbag with a small sponge applicator tip. The shiny gel is colourless on the lips. It is wonderfully silky and soothing but not gummy or sticky like some lip balms. The first day, I noticed the tiniest tingling (which I attributed to the Cinnamon Essential Oil) but after that I have felt only a fresh, soothing sensation. If you are not into lipstick, it is tempting to use this throughout the day in lieu of a lip gloss, but the directions warn against it. The packaging is a bit vague but the Amazon product page clearly says to apply it to clean lips only twice a day, morning and evening in my case. After regular use for almost two months (yes, there is still some left! ), I have to say that it has improved my lips in a subtle but visible way. The greatest change happened in the first three weeks, and now we seem to be in maintenance mode. It didn't change my mouth shape in any way, but it has restored the volume that used to be there in my forties. For me that's already a big deal. I've just had a new passport photo taken and it's curious to see that, although my face shows more wrinkles, my mouth actually looks younger than it did in the old photo from five years ago! I will continue to use this and will buy it again once my sample is finished because I like what it does for me.